Behind the house where he has lived with his wife for nearly 20 years, the north light shines through the floor to ceiling windows in Jim Daly’s dream studio, located in Eugene, Oregon. 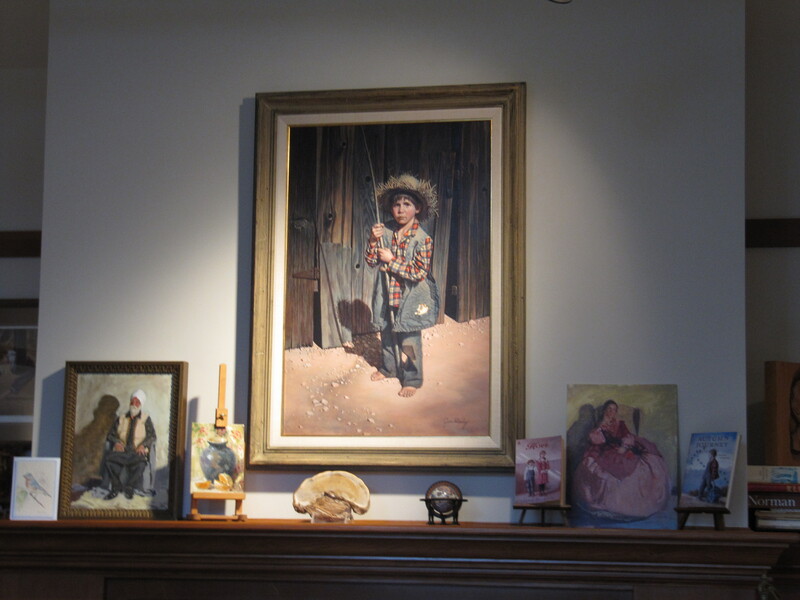 The natural light reveals decades of paintings hanging on the walls, countless binders of photographs used as references, bookshelves packed with biographies of his heroes from Norman Rockwell to John Singer Sargent and an ever-growing collection of props used in his paintings. 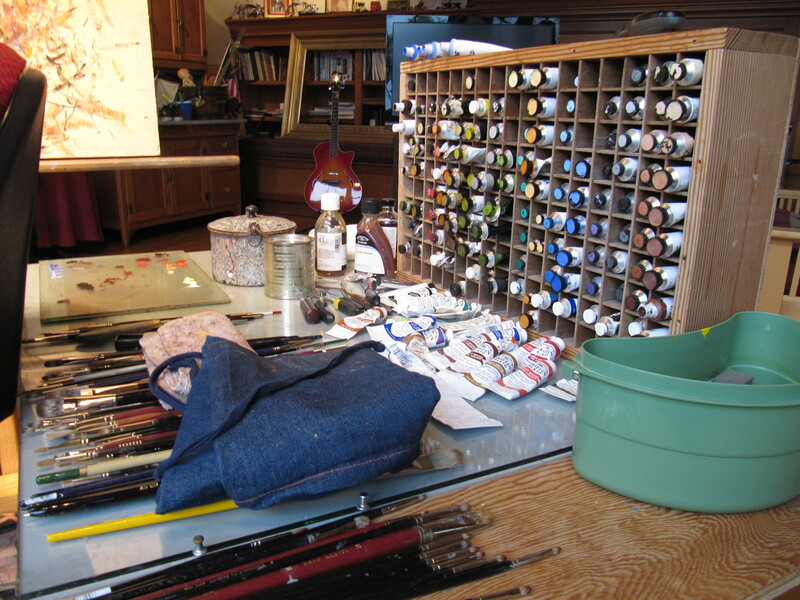 The strong scent of oil paints lingers in the air from the recent completion of a painting. Like all the others, this new creation was taken from a memory of his childhood. 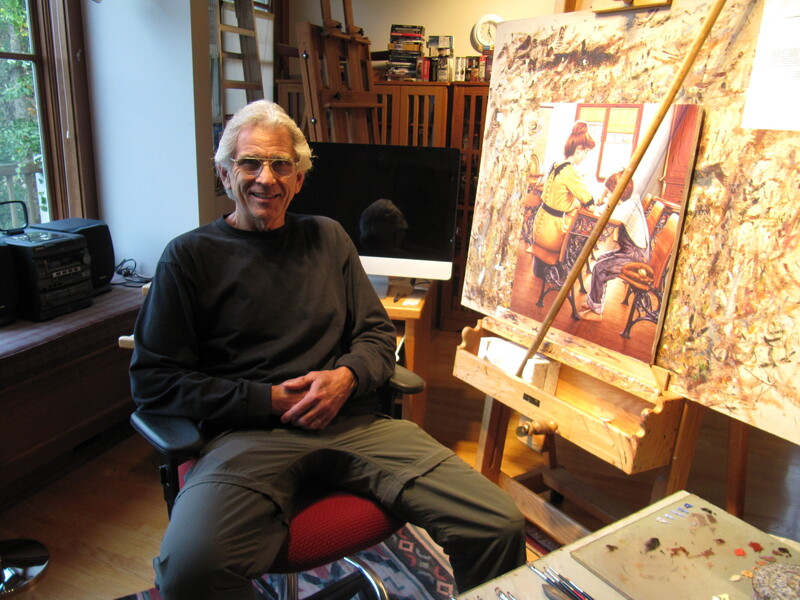 Father of four and grandfather of three, Daly personalizes his paintings not only with scenes from his own childhood in Oklahoma, where he was born, and in Los Angeles, where his family later moved, but also with the use of family members as the models. Each of his pieces pulls the viewer in, causing all time to stand still, with the exception of the memory that is being recreated and reenacted on the canvas. 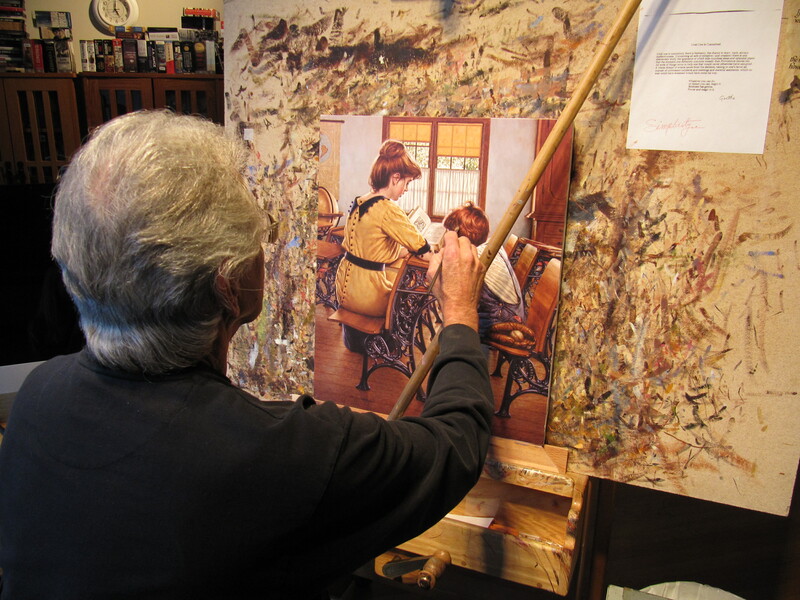 His nostalgic paintings hang in various galleries across the country, illustrate the stories of children’s books, including the best seller “What Little Boys are Made of,” and appear in art magazines, like “Art of the West.” Daly’s artistic career, however, was not easily created as he worked hard to stray from the idea of what is “artistically correct,” meaning what is expected in a painting. Daly’s use of paint is his way of telling stories and recreating past memories in ways that photographs or even our own memories are not capable of. He believes “Learning to paint is a tool. Having something to say as an artist is important.” The paintings that cover the walls of his studio all tell a story. One depicts a schoolteacher reading to a young boy in an empty classroom as the late afternoon sun shines through. Another illustrates the life of a boy and his companion of a dog playing in a scene all too similar to the yard that is visible through the floor to ceiling windows in Daly’s studio. Despite the many paintings hanging in the large, high ceilinged room, one in particular stands out. Hanging above the fireplace is a young, barefoot boy who’s holding a fishing pole and wearing a straw hat, patched jeans, a jean vest and a plaid flannel. The look in his eyes is that of innocence and of a life that was taken all too suddenly. 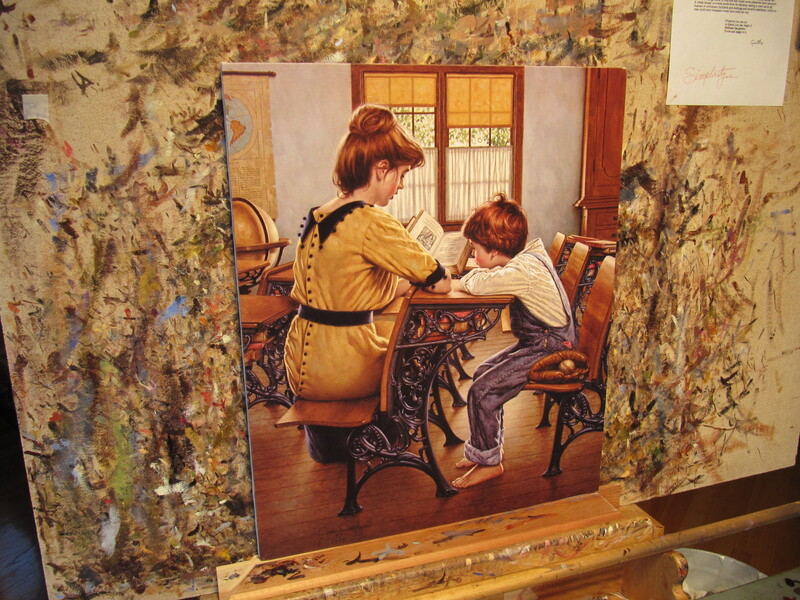 The boy in the painting is Daly’s son, Jerry, who passed away at age six. The north light that shines through illuminates not only the entire studio, but also another painting that breaks all the rules. This entry was posted in Uncategorized and tagged #J361NN, #JimDaly, #JohnSingerSargent, #NormanRockwell, #paintings, Art, profile. Bookmark the permalink.